Your sales pipeline is one of the most important indicators of your company's health and viability. Don't leave it up to chance. Manage your sales pipeline with Bullhorn CRM so that you can be confident about what’s working and where there are bottlenecks, anticipate the likelihood of deals closing, and identify opportunities to close deals faster. Bullhorn CRM includes pipeline views, sales team and individual salesperson activity reports, opportunity-specific activity reports, and more. Sales management can create additional configurable reports for greater pipeline visibility. Knowing how your company has performed on past deals helps you quickly spot trends and forecast what may happen next. 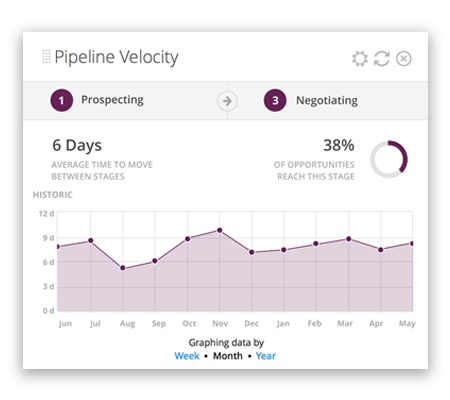 Bullhorn CRM’s Pipeline Velocity card is fully configurable to deliver real-time insights on the average time it takes to move opportunities across stages and the percentage of deals that reach a given stage. Get greater insight into your sales cycle velocity and identify opportunities to close deals faster. You can’t optimize what you don’t measure. Keeping track of your sales effectiveness over time is imperative for managing a healthy pipeline and predicting future sales outcomes. Bullhorn CRM’s Win Rate card helps you understand your likelihood for success based on past trends by week, month, or year. Does seasonality impact your business? 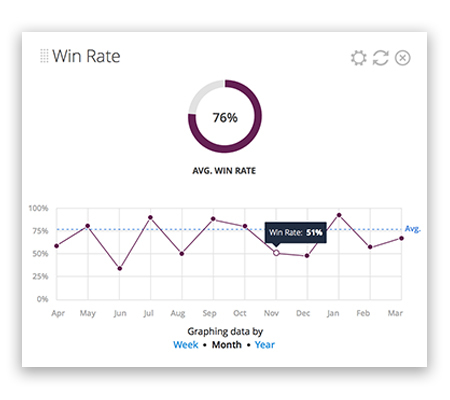 Get ahead of the summer lull or the holiday rush with real-time data on your current and historical win rates. Want a quick snapshot of the opportunities in your pipeline? Need to know the weighted value of the deals still in play to reach your sales quota? 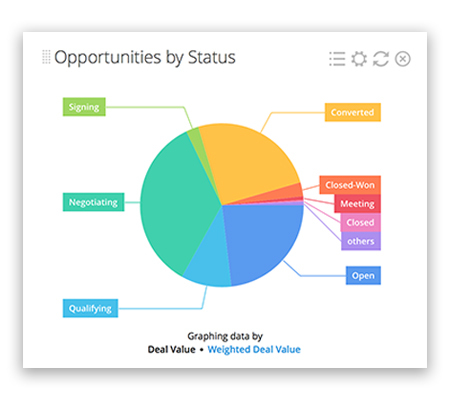 Bullhorn CRM’s Opportunities by Status card provides you with the most up-to-date view into your sales pipeline by stage, deal value, and weighted deal value. With these insights, you can quickly identify which opportunities and opportunity stages are the most promising to get you to your sales quota. You live in your email inbox, day in and day out. At Bullhorn, we know that your sales team can’t afford to miss conversations with prospects and clients. With patented email and conversation tracking, they never will. 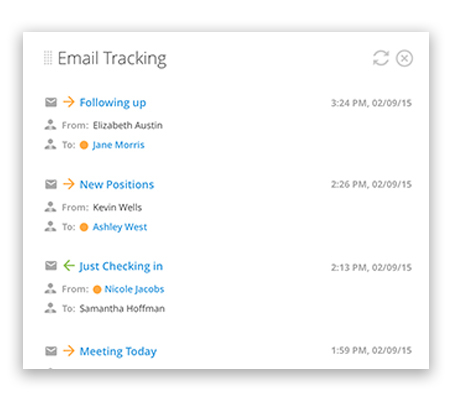 Bullhorn provides a deeper integration with your email and conversation activity. With Bullhorn's passive activity tracking, all inbound and outbound email activity is automatically captured in Bullhorn, so you are always prepared for the next conversation. 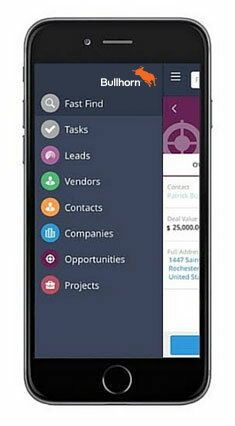 Bullhorn delivers its CRM platform through any mobile device or tablet, allowing sales professionals to manage customer relationships anywhere at any time. With the ability to add notes, access existing records, and email notify colleagues, you and your team will have full visibility and be better prepared before, during, and after client meetings. Make better decisions, improve sales productivity, productivity, and manage the entire sales process in one easy-to-use environment.